One of the key goals in any game is immersion in the story. One facet of immersion in an MMO is allowing significant numbers of players to be one the screen at the same time. But the players are not the only people in the universe – we also need to populate the FHS Justice with civilian NPCs and cars to make a believable city of the future aboard a generation ship on the outskirts of the Human Federation. This newsletter will show off some of our work, and we’ll also talk about what is coming next for Ship of Heroes. 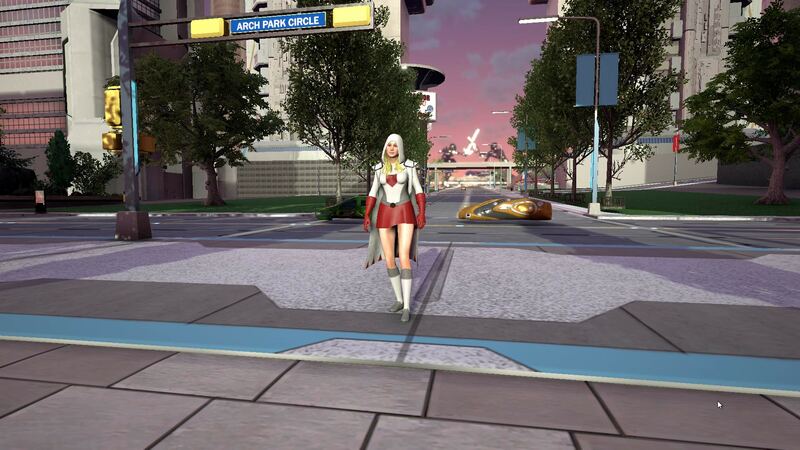 An afternoon picture looking north from the Arch Park to Heroic Plaza, with Dr. Strikewell and a futuristic antigravity car traveling through the streets of the city. One of the things we’ve been working on is setting up civilian NPCs to populate Apotheosis City. 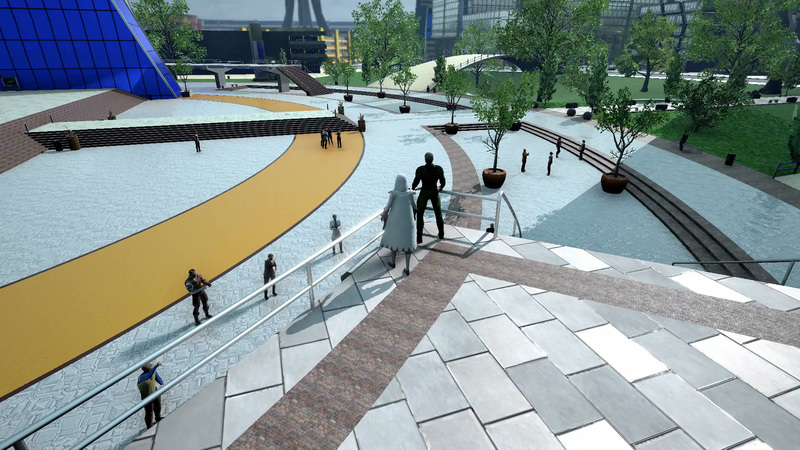 For this newsletter, the area we’re showing is the Arch Park at the center of Apotheosis City. Adding cars and NPCs takes some effort, and has required our dev team to work out some issues in order to maintain reasonable FPS for our new MMORPG. To do this, we have to decide: how many NPCs should be active in a given area? No one wants to play in a ghost town, but each NPC adds a little more strain to running the game. In the shot below, there are over 100 civilians in the Arch Park, and at any given time, a player can see about 20. We think this strikes a good balance between immersion and FPS. As a supporter of SoH, feel free to weigh in with your opinion in the forums on whether this is the right density of civilians. Dr. Strikewell standing next to a citizen of the Justice, who is regaling his friends from one of the Arch platforms. We’re also looking at how to make our NPCs as realistic as possible – as with any first attempt, there’s plenty of room for improvement. For example, with the man below, we plan to get something into his hands for him to be reading or examining. And of course, one of the challenges is that he needs to have the ability to sit down and stand up, or even to run off if there is a Nagdellian attack on the Arch. 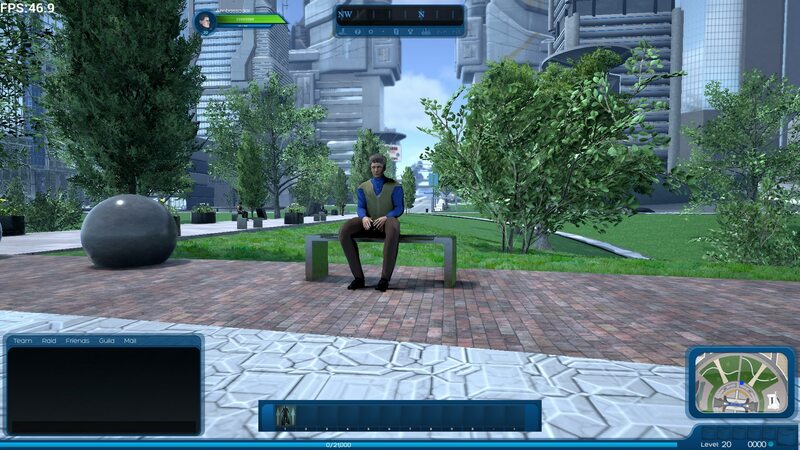 A citizen taking a break in the park, in Apotheosis City. In the gif below you can get a sense of what it will be like to run through the city, suppressing criminals, fighting rebels, and defeating alien invasions. Note that the cars, like most art assets in SoH, were created by our talented art team. Making them zoom along is the work of our skilled coders. And the frictionless, hovering design is the result of our story and game team projecting what we think a positive, technologically-advanced future might look like. A look at the early traffic around the Arch Park, in the morning. And here is Dr. Strikewell showing off a few of the car models parked at the side of the road. You can see that the cars levitate even when they are not moving, to facilitate entry and exit. 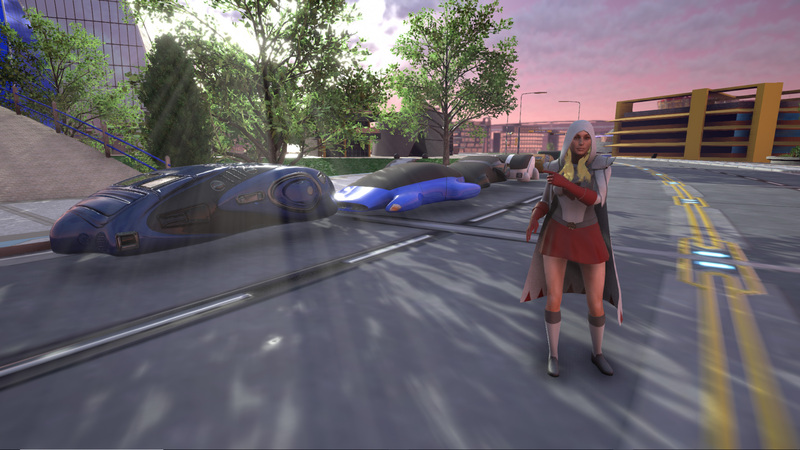 Dr. Strikewell showing off a few of the cars in Apotheosis City. As we have mentioned in the past, some of the things we’re going to tackle next include more in-game videos to give our community more in-depth exposure to Ship of Heroes as it develops than simple text ever can. We’re planning a video on the subject here – immersive cars and NPCs in the city – and a long awaited video on the day/night cycle which will show just how beautiful the future world of the FHS Justice can be. We’re also working to fix all the issues required for a login test; although this is taking longer than we had hoped at first, the test is still the next big thing that the community will be able to participate in. We’ve found and solved most of the problems involved already, and while the last couple aren’t easy, we’re making steady progress. And we’re planning another engine upgrade, to 4.20 this time, which will add some interesting new capabilities to the toolkit our development team uses, keeping the whole game on the cutting edge technically.